Tortillas were used in South America by indigenous peoples for thousands of years. The Spanish conquistadors coined the name tortilla (in Spain, a tortilla is a flat omelette usually filled with vegetables, or cod, which is cut into quarters like a cake.) While the conquistadors introduced different kinds of meat, certain citrus fruits, garlic, cheese, wheat, and wine to the new world, they brought back items such as chocolate, peanuts, beans, squash, avocados, coconuts, corn and yes, tortillas back to Europe. Flour tortillas have a wide range of uses at the kitchen table. They can be eaten with practically anything, from stuffing your favorite foods in one to make a quick wrap on the go, to smoothing a chunk of cheese on a tortilla roll and making a super-thin pizza. 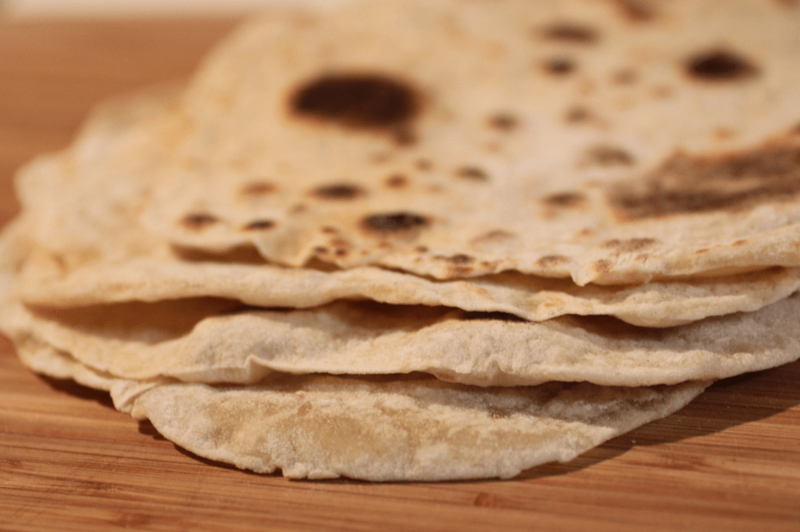 Take a look below at how to make homemade flour tortillas. Using a measuring cup, mix the salt with water. Stir until salt has dissolved. Use a medium bowl and add your lard and flour. Get messy and work the mixture with your hands until it is a fine crumble. Pour 2/3 of your water into the mixture. Stir the mixture until it is lumpy. Add the remaining water and turn out onto a floured board. Knead the mix until it really starts to stick together – about 5-10 times should do the trick. Divide the mix into 12 pieces. Place each section into a pan and cover it with plastic wrap and allow the mixture to lay for 30 minutes. Once the divisions have had ample time to lay and rest, roll each one into a pin shape about 7 inches in diameter. Keep any dough you are not using covered while you mold the other dough. Roll each pin one at a time and cook each one of them individually. Transfer them gently from the plate into the pan. Put your pan over a medium to high setting, and let each tortilla pin sizzle for about 30-35 seconds. Make sure you do not burn your tortillas! They should be a light brown, not black. If you think you have waited long enough, you have – remove the tortilla! These tortillas ready to enjoy. Tortillas are best enjoyed with a burrito or taco, particularly the chimichanga, which combines the brittle goodness of a tortilla with your favorite cheese and meat.